If you have children, you can go see this movie and not want to stab yourself in the face with sharp objects. That is the best and most glowing review I can give. Storm Reid, who plays Meg Murray, does a great job in the film. Her character is angry and sad, because her father disappeared four years ago and the wound has not healed. Kids at school tease her and her self-esteem is at an all-time low as we mark the fourth anniversary of his disappearance. Her scientist father is played by Chris Pine, who the audience knows has gone missing due to an accident in “tessering,” which is crossing into another part of our universe by wrinkling time. Meg plays opposite her genius brother, Charles Wallace (played by Deric McCabe), who is a true delight. I enjoyed his character quite a bit and thought his acting skills overshadowed all of the adults onscreen (yeah, even Oprah). One evening a strange woman shows up in their home and Charles Wallace is a bit surprised. He tells them he asked her to come help and she introduces herself as Mrs. Whatsit (Reese Witherspoon). She briefly mentions her friends, Mrs. Which (Oprah) and Mrs. Who (Mindy Kaling). Soon enough Charles Wallace has recruited a boy from Meg’s class, Calvin (Levi Miller), to come with them on the journey to search for their dad. Against Meg’s better judgment, they follow the three Missus across time and into another universe by way of tessering. The journey to find their father is filled with new worlds and a battle of good vs. evil. Along the way there are concepts that are heartfelt and at times inspiring. It touches on being yourself, embracing your faults, love triumphing over hate, good over evil, family, and sticking together. There are moments where you think man, this is a great moment. But they are fleeting and often drowned out by the music or the fast paced changes between foreign worlds. I found some scenes to be a bit scary for kids, mainly because they were nerve racking for me. The costumes were lovely, the colors were beautiful but it mostly felt like an elaborate Apple desktop background as opposed to a movie that I was enjoying. I am not a huge sci-fi lover so the entire plot was hard for me to wrap my mind around. If you can see it for free- maybe go see it. If you have kids, you can definitely stomach this and there’s no harm in the messages it’s pushing. If you are a group of adults, skip list as it was just a bit too wrinkled for my likes. 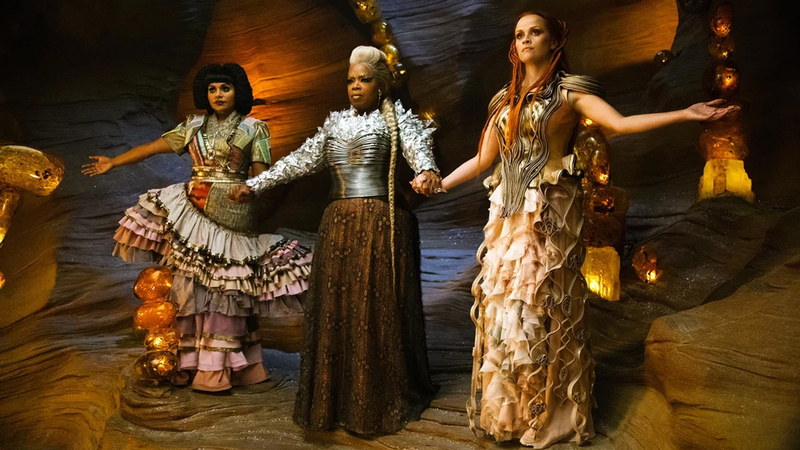 The Video: A Wrinkle in Time comes with a glorious 1080p HD transfer and is presented in 2.39:1 aspect ratio. This image looks simply spectacular through and through. This is a highly colorful film with tons of different shades of primary colors that just illuminate every bit of the screen. Colors are radiant and robust on every level. On the different planets, you will see delicious green pastures, or blue atmospheres that truly shine. There are moments when tons of different plant life burst into air with explosions of different colors, which just lights up the screen. The wardrobe is just as good with heavily detailed colors all around. Detail is also sharp and vivid throughout too. The textures in the costumes and heavy makeup on the actors all look excellent. You’ll be able to see individual glitter makeup effects and intimate stitching in the wardrobe. Tons of facial features are easily visible too. Some of the heavy CGI effects also have an incredible amount of detail that never seems to go soft, even in darker sequences. Black levels are very deep and the skin tones are natural. There were no issues with any banding, aliasing or vide noise to speak of. What a great video presentation. The Audio: This release comes with a lossless DTS-HD MA 7.1 mix and is quite dynamic. Still, Disney as of late has me turning up the volume on my receiver higher than normal to hear anything on screen. I’m not quite sure why Disney home video is putting their audio tracks like this, but it’s rather annoying. Still, once you find the good volume where you can hear the track, it sounds very good. A couple of things to note though here. The bass doesn’t really kick into high gear at any one point in time. There are flashes of moments where the bass can be heard, but it’s very subtle. Also, when the heavier action sequences come into play, all sound effects are softer than normal, but still lively and well balanced. Sounds of screams, laughter, and other effects all are full and atmospheric that can be immersive. It just isn’t like listening to a movie with The Rock in it. The score adds to every nuance moment in the movie while the dialogue is clear and easy to follow, and free of any pops, cracks, hiss, and shrills. 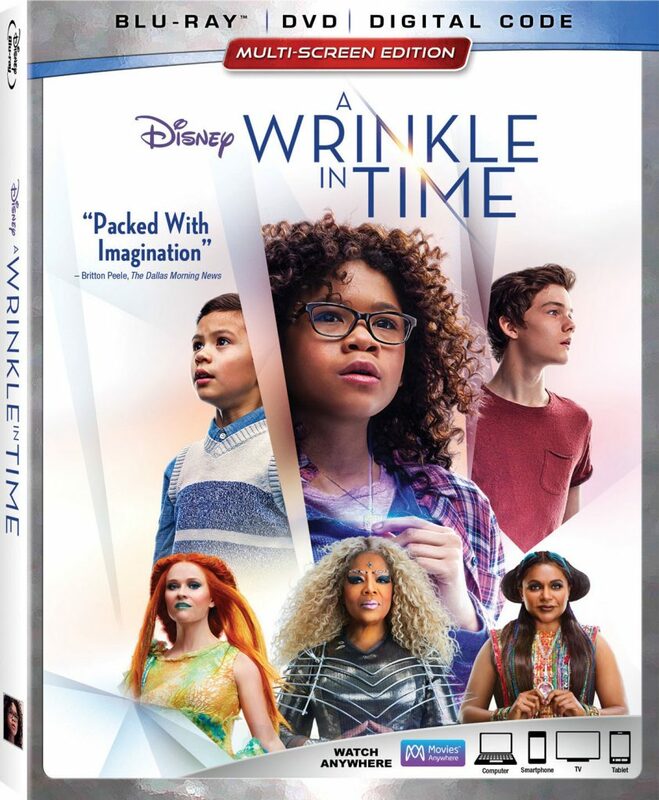 Audio Commentary – Director Ava DuVernay and six other crew members, including writers, visual effects wizards, producers, and others all come together to talk about the making the film. It’s a rather crowded track that is never any fun, but offers a ton of info on making the film, the story, origins, casting, performances, and set pieces. If you’re a fan of the film, you might like the movie. A Journey Through Time (HD, 31 Mins.) – Here is a good lengthy behind the scenes extra where topics of discussion include the direction, the book, the tone, themes, casting, performances, visual effects and more. Deleted Scenes (HD, 10 Mins.) – There are four different deleted scenes, all of which are worth watching if you’re a fan of the film. These all come with optional Ava DuVernay commentary. Music Videos (HD, 8 Mins.) – Two music videos from two songs in the film are here. Bloopers (HD, 2 Mins.) – A very short and standard montage of laughs, missed cues, and flubbed lines. 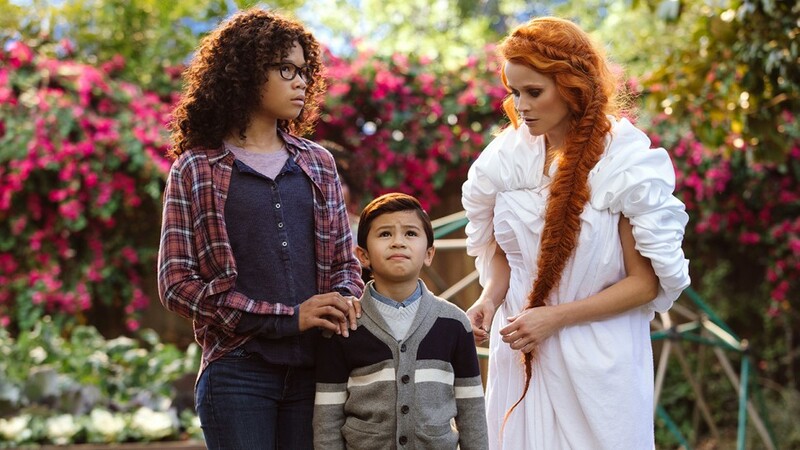 A Wrinkle in Time is a beloved book and was bound for a film adaptation at some point. This adaptation does its best to service newcomers and fans of the books alike, but at times, it falls flat. That being said, the visuals are quite breathtaking along with a good and endearing message at its core. Plus, it’s always good to see Oprah in a film, no matter how good or bad. The video presentation is top notch and flawless, where the audio mix is good, but needs a little push. The extras are worth your time if you like the film, but nothing that stands out. This Disney release comes Recommended for Fans! This entry was posted on Wednesday, May 30th, 2018 at 11:21 pm	and is filed under Film, News. You can follow any responses to this entry through the RSS 2.0 feed. You can skip to the end and leave a response. Pinging is currently not allowed.